Everett, WA – The Everett AquaSox received the 2016-2017 Spirit of the Community Award from the Everett PTSA Council during their 2016-2017 Awards Recognition Banquet at Everett Community College on May 25, 2017. The AquaSox were recognized for their contributions to the students in the Everett School District. Kellie Howard, Community Relations & Merchandise Manager was on hand to accept the award for the organization from Everett PTSA Council President, Angela Steck and Program Chair, Denise Constantineau. “During my two years with the AquaSox I have had the privilege to kick off our Hit a Home Run in Reading Program and truly see the kids’ eyes light up when they find out they can see an AquaSox game and Webbly all by reading books!” Kellie shared. Hit a Home Run in Reading Program presented by SoundTransit is a 4-week program that starts in the Spring months and in 2016 over 60 elementary schools and over 27,000 students in Snohomish County participated in this free program. The program kicks off at each school with a special appearance by Webbly and celebrates the reading program awards. In 2017 prizes included a student designed bookmark featuring artwork from four different students, free admission to the Woodland Park Zoo, a personal Alfy’s Pizza, discounted Port of Subs kid’s meal and a ticket to an AquaSox game with their school. Schools are invited to attend select games during our Opening Week where they are recognized during a pre-game on-field parade. 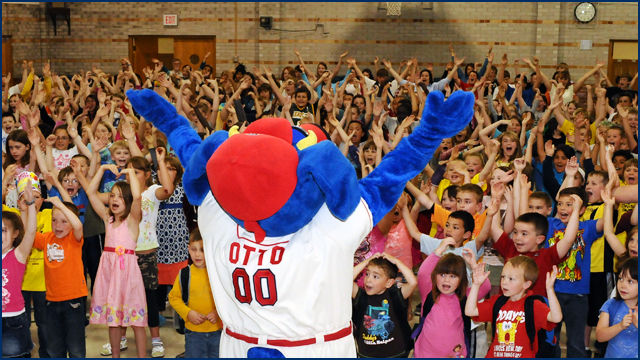 Since 2009 over 200,000 students have participated in the ‘Hit a Home Run Reading’ program. 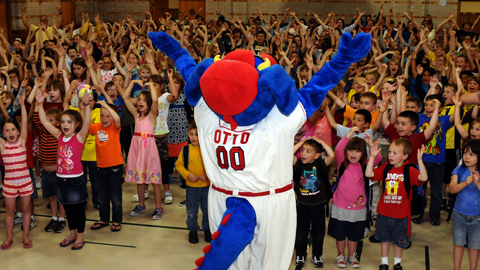 General Manager, Danny Tetzlaff said “We are very honored to have our ‘Hit A Home Run Reading’ program recognized. Using AquaSox baseball to encourage student to read is a real homerun!” The first ‘Hit a Home Run Reading’ program Night is Opening Night June 15 against the Hillsboro Hops. Group tickets, family outings and ticket packages are currently available and selling fast for all games for the 2017 season. To purchase your tickets for Opening Night our office at (425) 258-3673 or visit AquaSox.com for more information. The Tacoma Rainiers and Carol Milgard Breast Center (CMBC) have teamed up for a fourth consecutive season to host ‘Pink at the Park’ this Saturday, July 12th at Cheney Stadium – a benefit game devoted to raising money to fund mammogram screenings for medically underserved women in the South Sound. 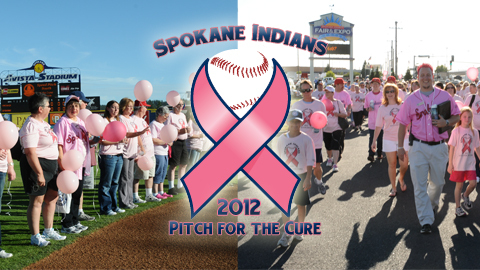 This year’s event begins when gates open at 6 p.m. for the Rainiers game against the Fresno Grizzlies. The first 3,000 fans arriving to the ballpark will receive limited edition pink trucker hats courtesy of CMBC. Pre-game activities will also include video testimonials of patients who have successfully defeated breast cancer and the formation of a ‘Circle of Hope’ around the pitcher’s mound that will be comprised of breast cancer survivors and their friends and families. Survivors will release pink balloons symbolizing the release of fear and renewed hope for the future. When the game gets underway at 7 p.m., each Rainiers player and member of the coaching staff will wear special pink jerseys in recognition of breast cancer patients and their families who have battled the disease. Each of the game-worn jerseys will be autographed and auctioned off as part of a live auction along the third base line of the stadium immediately following the conclusion of the game. Proceeds from the auction will go directly towards CMBC to support the breast center’s continued efforts to provide sustainable breast health services for all women in the South Sound. 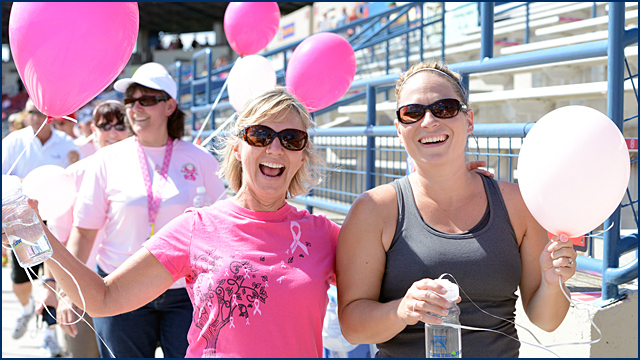 “Pink at the Park is our flagship fundraiser for the breast center,” says Jackie Ostrom, executive director of CMBC. “The money raised during this event plays a key part in helping us fulfill our mission of treating all patients, regardless of their ability to pay.” To date, CMBC has provided over $2.3 million in compassionate care services to medically underserved and underinsured patients in our community. CMBC recently celebrated its fifth anniversary as the first dedicated breast imaging center in the South Puget Sound. Since welcoming its first patients on February 23, 2009, CMBC has provided more than 120,000 screening mammograms to women, and has performed more than 250,000 exams and procedures in total. The breast center’s most important milestone, however, has been saving more lives through early detection. CMBC estimates it has diagnosed over 3,000 breast cancers in its first five years. “We’re honored to be making a real difference in our community, because we know that early detection saves lives,” says Khai Tran, M.D., medical director and visionary of the breast center. Breast cancer continues to rank as the most commonly diagnosed cancer in women, with one in every eight women in the U.S. affected by the disease. Women whose breast cancer is detected at an early enough stage have been shown to have a 93 percent or more survival rate. The breast center supports screening guidelines established by the American Cancer Society, recommending that every woman 40 years of age and older receive a routine screening mammogram every year. The Carol Milgard Breast Center is a non-profit organization whose mission to provide sustainable breast health services to all women in the South Sound is reliant upon support from the community. For additional information about the Carol Milgard Breast Center or to contribute a donation, please call (253) 759-2622 or visit CMBC online at www.carolmilgardbreastcenter.org. To purchase tickets to the Rainiers ‘Pink at the Park’ game this Saturday or another upcoming Tacoma Rainiers game in 2014, please visit the team online at www.tacomarainiers.com, call 1-800-745-3000 or visit the Cheney Stadium Box Office located at the front entrance of the ballpark. Up-to-date news and notes about ‘Pink at the Park’ or any can be found at www.tacomarainiers.com and by following the Rainiers on Twitter (@RainiersLand) or liking the team on Facebook. This article originally appeared on the official website of the Tacoma Rainiers. Click here to view the original story. The Yakima Bears were proud to present the American Red Cross with $1,110 Wednesday. The funds were raised during the team’s most recent homestand to help the victims of the Taylor Bridge Fire in central Washington. Money was accepted at each of the six games the Bears played from Thursday to Tuesday. There were cups at each concession stand and a bucket near the front gate where fans could drop cash donations. Bears fans also participated in nightly raffles with the winners taking home a variety of jerseys and team-signed baseballs. “It was exciting to see the response from our fans, who were inspiring with their generosity,” said Bears general manager K.L. Wombacher. This article originally appeared on the official website of the Yakima Bears. Click here to view the original story. The Yakima Bears have announced that throughout the six-game homestand beginning today the team will be collecting donations for the victims of the Taylor Bridge fire. “While we can only imagine the hardships suffered by our neighbors in central Washington, we know that with roughly 10,000 people expected to come through Yakima County Stadium over the next six days we can provide an avenue for aid,” said Bears General Manager K.L. Wombacher. The Bears will have a bucket at the front gate and collection jars at concession stands for all six games. The team will also be holding a raffle for game-worn jerseys and team signed baseballs on a nightly basis. The Bears will give 100% of the funds collected to the Ellensburg Chapter of the American Red Cross to help victims of the fire. As of Wednesday, it had been reported the fire near Ellensburg and Cle Elum in central Washington had burned approximately 22,000 acres and hundreds of people had been displaced. TACOMA, Wash. — The Tacoma Rainiers and Union Bank have partnered with the Boys and Girls Clubs of South Puget Sound to swing for the fences and send underprivileged youth to baseball camp this summer. For every home run hit by a Rainiers player during home games played from July 12th-August 20th, Union Bank has pledged to donate $50 toward scholarships to the Boys and Girls Club baseball camp held at Cheney Stadium on Tuesday, August 21st. The Rainiers have committed to matching the donation contributed by Union Bank and will give an equal amount dedicated to sponsoring underprivileged youth at this year’s camp. Along with lunch and a complimentary T-shirt, every participant at this year’s baseball camp will be provided an opportunity to interact with and learn from some of the top players and premium prospects on the Rainiers. Campers will sit in on a team meeting with Tacoma manager Daren Brown before taking part in a variety of baseball drills. An autograph session will be held at the conclusion of the camp. For any additional information regarding this year’s camp or to donate a scholarship for a camper, please contact Jinnie Hanson, Director of Marketing and Communications for the Boy and Girls Clubs of South Puget Sound, at (253) 502-4618 or by emailing hansonj@bgcsps.org. The Yakima Bears will host Prostate Cancer Awareness Night during a 7:05 game against the Tri-City Dust Devils at Yakima County Stadium on Saturday. The event is sponsored by Washington Hematology-Oncology and will feature some special appearances and a fireworks extravaganza. The Bears parent club, the Arizona Diamondbacks will be sending former Major League All-Star Luis Gonzalez to the game along with team President and CEO Derrick Hall. Gonzalez, whose 19-year Major League career was highlighted by a game-winning hit for the Diamondbacks in game seven of the 2001 World Series, will sign autographs on the concourse from 6:15 to 6:45 that evening. Hall, who has been team president since 2006, will speak to the audience before the game about his own battle with prostate cancer last year. Following the game, there will be a fireworks show courtesy of the night’s sponsor, Dr. Al Brady of Washington Hematology-Oncology.